Brockville, Ontario – Sunday, Oct. 20, 2013 – Martin Bélanger, DIRTcar Correspondant– Erick Rudolph, of Ransomville, N. Y., claimed the DIRTcar 358-Modifed Series Championship with a thrilling victory in the tour’s 100-lap final round of the during day 2 of the 1000 Island RV DIRTcar Northeast Falls Nationals. Rudolph claimed the lead in lap 67 of the feature race Saturday, Oct. 19, and didn’t let up until the checkered flag waved. Last Sunday’s Syracuse 200 winner at Syracuse Billy Dunn and local runner Lee Gill shared the top row for the start of the 100-lap event. Dunn took the early lead with DIRTcar 358-Modified Series point leader Erick Rudolph following in second. An early caution slowed racers in lap 6 as Lee Ladouceur stopped in turn 4. The top two leaders remained the same off the restart, with Brian McDonald powering ahead to claim third. Gill and Danny O’Brien followed. Dunn joined slower traffic at the backend of the field, where cars running side-by-side slowed his progress. Running in fourth spot, Lee Gill went off turn 3 and the yellow lights were lit with 23 laps down. A lap 32 restart saw Dunn still in the lead. Brian McDonald by cracked the top 5, but he stepped out of turn 2 and the yellow got out as the feature neared its midpoint. The halfwas point was reached under caution, with Dunn, Rudolph, Danny Johnson, Danny O’Brien and Dale Planck making up the top 5. Planck was able to pass Danny O’Brien just before another yellow was thrown with Dave Austin having issues with his mount. DIRTcar 358-Modified Series contender Mat Williamson made his way in the top 5 as Billy Dunn slipped off the track, losing valuable spots and giving the lead to Erick Rudolph on lap 67. With 25 laps to go, Rudolph,Johnson, Planck, Williamson and Danny O’Brien composed the first five. Both Johnson and Danny O’Brien had issues with their cars, losing their top 4 positions in lap 81. On the restart, Rudolph remained the leader. Pat O’Brien lost his fifth spot in lap 90 with a flat right rear tire, giving his spot to Dunn who made his way back with the leaders. Williams also succumbed to a flat tire late in the race, losing his third-place position with one lap to go. Rudolph managed to lead the last two laps in the green-white-checkered finish, winning his first event of the season and securing his first-ever DIRTcar 358-Modified Series title. Dale Planck, Billy Dunn, Alain Boisvert and Carey Terrance completed the top 5. Rudolph was ecstatic in winner`s circle: “Wow! I can’t believe it, winning the race and getting the championship, I am really happy!” Rudolph was thankful for his team: ‘’I would like to thank everyone for a great year in the Snyder Industries Car’’. Erick Rudolph reached two career milestones on Saturday afternoon at the Brockville Ontario Speedway. 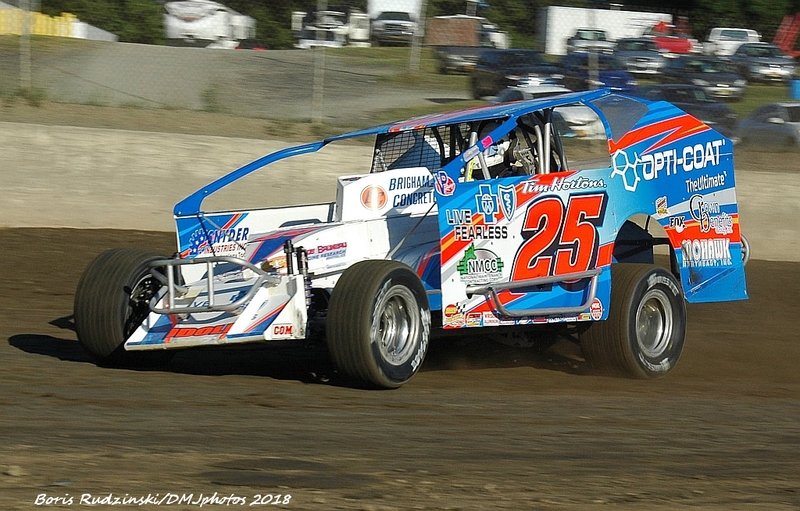 The Ransomville, N.Y., native captured his first ever 358-Modified Super DIRTcar Series win while taking home his first ever 358 Modified DIRTcar Series championship. Rudolph was aided by a miscue by Syracuse 200 winner Billy Dunn. Dunn led the way early on the rubbered up speedway before missing the groove in turns one and two which sent him over the banking. This allowed several cars to get by while putting Rudolph into the lead. Over the final 20 laps several drivers dropped out with tire issues, including several drivers in the top five causing some concerns for those out front. Rudolph did what he could to keep his tire underneath him in order to make it to the finish. Joining Rudolph in the championship celebration Saturday afternoon was Quebec driver Steve Poirier. Poirier captured the Patriot Sprint Tour Canadian championship on the back of a second place effort. It is his first Patriot title and it comes on the heels of his fourth Lucas Oil Empire Super Sprint championship. Poirier was running a race within in a race as he came in leading Jason Barney by three points needing to beat him in the finish. Barney started sixth, with Poirier eighth. On the first lap Barney spun after contact from behind from another car putting Poirier in front of him leading him to the championship. Poirier nearly made a poor decision by electing to go with a soft tire in order to make an effort to pass Barney early. Fortunately he did not go with that option, choosing the harder tire, because every driver that elected to go with the softer compound would end up with a flat. Brockville Ontario Speedway Notes: 40 358-Modified entered into action on Saturday afternoon in the series finale and they were joined by 15 Patriot Tour Sprint Cars. Bryan Howland picked up the companion Sprint Car event. As mentioned earlier, Dunn was leading the Modified race before going over the top of the speedway and falling back to eighth. He eventually drove back up into the top three to finish on the podium. It was a depressing day for the racing O’Brien family on Sunday as all three got a flat tire, in consecutive order during the 100-lap feature. Danny O’Brien got the first flat on lap 81 with Pat O’Brien having the same fate on lap 90. Then on lap 94, Tim O’Brien got a flat tire. Each time when the flat occurred they were driving inside the top ten in the event. Mat Williamson came into the day needing some help as he trailed Rudolph by just over 50 points in the chase for the 58-Modified championship. Williamson ran third as Rudolph led, but unfortunately got a right rear flat with a lap remaining in the feature.